Product prices and availability are accurate as of 2019-04-20 16:17:37 UTC and are subject to change. Any price and availability information displayed on http://www.amazon.com/ at the time of purchase will apply to the purchase of this product. 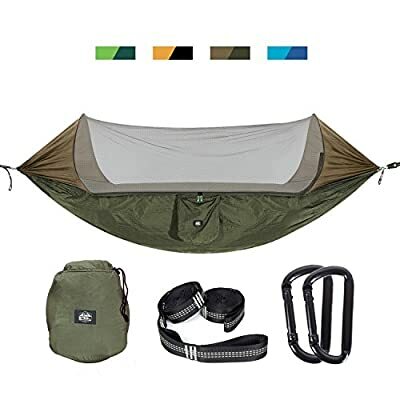 ETROL hammock with pop up insect net design, no need to waste your precious outdoor time to set up the net with complicated ropes, protect you against any disturbance from mosquitos, bugs, flies or even smaller insect effectively; Perfect for your camping, backpacking, hiking, travel, boating, rafting, picnic, lake, park, campus, garden, backyard and other outdoor journeys! Why Go For A ETROL Camping Hammock? - is a true camping hammock, comfy and ultra-resilient! - has an excellent mosquito net to keep bugs and insects out! - works as a double lying hammock or sleeping bed! - with pop up insect net design,easy to set up ! - is made of 70D nylon fabric,soft to touch and good for health! - comes with all the installation tools (carabiners & straps) included!